The AX743 module is built to insert into any one of the high-speed module bays found on ProSafe GSM73xxS (4 optional bays) and GSM73xxSv2 (2 optional bays). 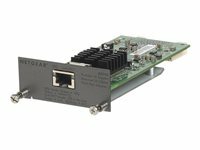 Once inserted, the AX743 adapter module can then be utilized with standard 10 Gigabit SFP+ GBICs for fibre connectivity at 10 Gbps speeds. 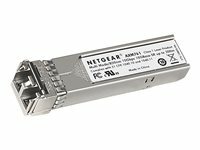 Specifically, this adapter module accommodates the ProSafe AXM761 SFP+ GBIC 10GBASE-SR LC "Short Reach" or ProSafe AXM762 SFP+ GBIC 10GBASE-LR LC "Long Reach". 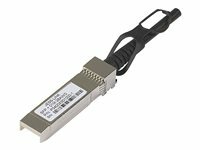 The AX743 is hot-swappable at any time into the switch and provides hot-swappable installation or removal of standard 10 GE SFP+ GBICs. 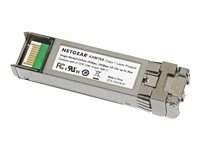 M5300 series provides largest 10 Gigabit choice for uplinks with SFP+ ports for fibre optic or short, low-latency copper DAC cables; 10GBase-T ports for legacy Cat6 RJ45 short connections (up to 50m) and Cat6A connections up to 100m; CX4 for legacy 802.3ak infiniband wiring. These reliable and flexible cables offer ultra-low latency for Servers, Storage and Switches short 10 Gigabit uplinks, and come in 1m and 3m lengths. Direct Attach SFP+ copper cable. 10 Gigabit SFP+ with ultra low latency. For servers, storage and switches short uplinks. SFP+ connector on both sides. 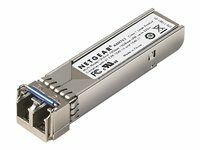 This GBIC is built to insert into any one of the two built-in 10 GE SFP+ interfaces of GSM7328Sv2 and GSM7352Sv2, and into the 10 GE SFP+ interface of AX743 adapter module for GSM73xxS/GSM73xxSv2. 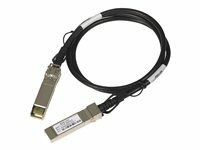 Once inserted (hot-swappable), the AXM761 10GBASE-SR SFP+ (LC connector) drives 10 Gigabit Ethernet up to 300m distances with 50/125µm OM3 multimode fiber cables, or up to 33 m distances with 62.5/125µm OM1 multimode fiber cables.This is a pack of 10 AXM761 SFP+ modules.